Villa in Weligama, Southern Province, Sri Lanka - Tranquility At Its Best. This is tranquility at its best…modern luxury living. 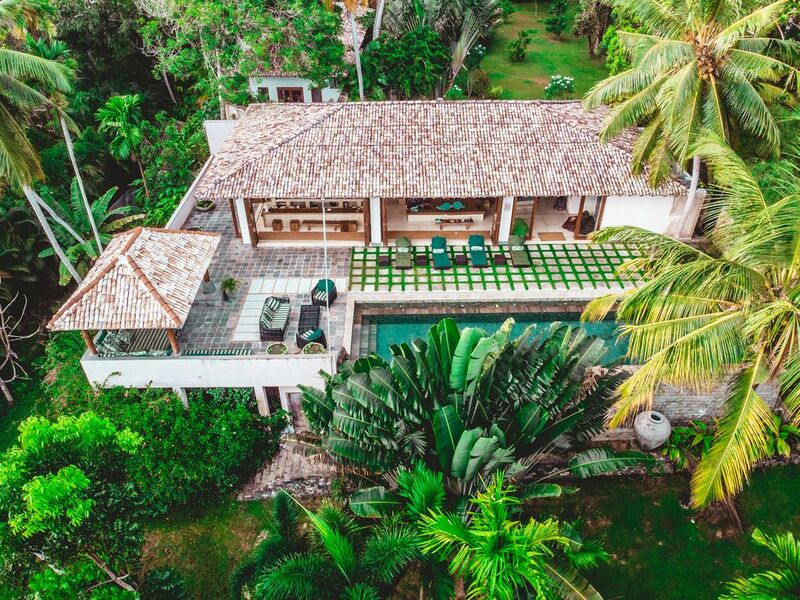 The villa is slightly elevated allowing those within to gaze across the canopy of surrounding king coconut palms and to enjoy the cooler breeze drifting off the ocean. Three luxurious one bedroom suites each with modern interiors, a king size bed, en-suite bathrooms with luxury toiletries, indoor rain showers - Aliyaa suite has a deep indoor bath while Thambili and Watte suites both have outdoor baths and the option to use outdoor rain showers. All bedroom suites have private sun decks and private gardens, a personal safe, air conditioners & ceiling fans. Aliyaa suite also has a spacious separate lounge. Maximum property capacity 6 Adults & 2 Children (up to 12 years in a single bed in a shared room with parents). Fully staffed we provide daily housekeeping as well as 24-hour security and a private guest manager to help with any requests during your stay. Complimentary daily tropical breakfasts, prepared by our cooks who can also provide delicious lunch and dinner dishes at a small cost to guests for groceries only. Weligama bay only a stroll away is one of the only places where you can windsurf and sail. It also has the best diving site on the island.Mirissa is only a few kilometers away, which is now known for its large fleet of whale watching boats. We fell in love with this beautiful country on a visit in 2005. We were lucky enough to be able to purchase the property that is now Kumara Villa in 2006 from a wonderful Sri Lankan family who still play a very important part in our lives. We have an amazing Kumara family on hand to look after all our very special guests, Welcome to Paradise! The feeling of seclusion was the draw card when we purchased the property. We have a beautiful outlook onto tropical lush mangroves and mangoes that are also enjoyed by troops of grey monkeys.Popular local beaches are walking distance and lots of local attractions are only a short ride away. En-suite bathrooms in all Bedroom Suites. Pool Pavilion has 2 additional bathrooms. All three bedroom suites are air conditioned. Wifi is available 99.9% reliable in the open plan living and dining of the pool pavilion. Pool pavilion is a relaxing open plan living/dining room space, with an over sized daybed and a 50 ft infinity edge swimming pool, large sun deck and thatched cabana with breathtaking views of swaying king coconuts and monkey loving mango trees. Nespresso Pixie for in guests private kitchen - one packet of pods supplied with each booking extra pods available to purchase. Separate kitchen with cooks who are able to prepare traditional and western meals, that can be served in either the Alfresco dining area or inside the pool pavilion dining area. Tropical breakfast provided daily, lunch & dinner at local cost to guests. A mix of board games are available. There are 4 adult bikes available for guests to use - ask Staff to arrange for an excursion. Utility Room: 4 adult bicycles. Board games. Pool toys. Cleaning / Towels / Linen / Maid service: Daily Housekeeping. Linen & Towels provided. Luxury toiletries. Nespresso coffee machine. Luxe, service de grand qualite, confort et calme. La Kumara villa invite au repos, au farniente dans un calme absolu dans la jungle et à 15 min des plages. Le service du personnel est de grande qualite : discret, serviable, soucieux du detail. Villa aux prestations haut de gamme, confort +++. The beach at Weligama bay is only 500mtrs away and is one of the only places where you can windsurf and sail. It also has the best diving site on the island. Mirissa Beach is 2 kms away and is now known for its fleet of whale watching boats. The back country off Weligama is also beautiful with rice paddies, rubber estates and low grown tea estates - a perfect place to bike and explore. Traveling from the city Colombo or the International airport to Weligama is now much easier and safer with the opening of the new expressway. The journey takes about 2-3 hours, time to relax and enjoy the local country side.